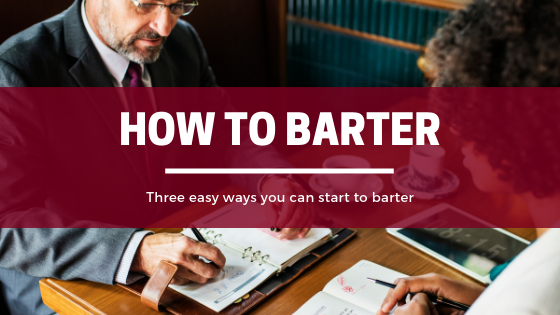 However, the principle of bartering is simply to trade something you have for something you want or need – and you can do this whether you are struggling financially or have a steady income. Any good or service that is desired by another person can be bartered from housecleaning and haircuts, to recliners and digital music players. Bartering is limited only by your imagination. #1 Figure Out What You Want to Get―and What You Can Give. What would you sell if you were having a sale tomorrow? Is any of it worth trading? What hobbies would you teach someone? Which common tasks do you enjoy? Make a list of people you know who might have what you want—and, want what you have. Join a local bartering club. Groups like CTX Club is a network of business owners who help each other prosper by trading products and services within our private network to increase business and reduce cash expenditures. Join a Time Bank. You can register (for free) at your local Time Bank’s website and list the services you have to offer. You will earn a “time dollar” for each hour of work you provide to another member. This “time dollar” is convertible for any service someone else has listed on the site. You can find a Time Bank in your area, or learn how to start your own, at timebanks.org. Visit specialized bartering websites. A lot of new sites have sprung up where you can exchange almost anything: professional services, repairs —you name it. Whether you’re bartering one-on-one, through a group, or online, set the terms of the agreement up front. Consider the dollar value of your goods or service. Trading something physical, like a sofa or a bike? Research the price of similar items online or in local newspaper classifieds. If you’re exchanging a service, determine what you would usually charge, separate in supplies. Then make an even exchange―for example, a $60 worth of nail polish for three $20 manicures; eight hours of driving lessons for eight hours of cooking lessons. Don’t forget the tax. In some cases, the law needs you to report bartering transactions on your tax return. “That doesn’t mean you have to state swapping babysitting with a neighbor,” says Anthony Burke, an Internal Revenue Service spokesman. “But barter between businesses is considered taxable income.” If you barter regularly, consult an accountant. Set the time frame. Decide how long you and your bartering partner will need to accomplish your part of the deal, and set a deadline. If it’s ongoing, it’s better to set a review date together. Put it in writing. For example, you’re a photographer who shot and designed a brochure for a local salon in exchange for services; you would end up revising the brochure several times, but you only received one cut and color. In this case the deal will last longer than one exchange, try sending an e-mail saying, “This is what I will do and what you will do in this time period,” But if it is worth a lot of money or is ongoing, it is better to sign a formal agreement.